Despite drawing negative feedback for its release of the Jordan Brand silhouette shoes last summer, the Jordan Brand won’t back down and they are aiming to impress this month with the release of the Jordan Prime 5 shoe. After it was unveiled in the final quarter of last year, the Jordan Prime 5 drew both positive and negative feedback, but the Jordan Brand is quite confident that the Varsity Red/Metallic Silver of the Jordan Prime 5 would exceed expectations this month. 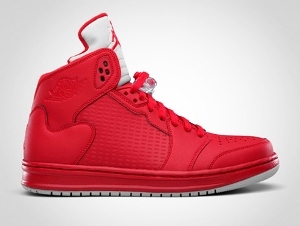 Featuring an almost all-red look with metallic silver accents on the outsole and tongue, the Jordan Prime 5 boast the features of Air Jordan 5 and Air Jordan, and with the success of its predecessors, the Jordan Prime 5 could be as hot as its color once it hit the shelves sometime this month!